My friend bought this wire hamper years ago. She's been using it for laundry but didn't have a liner for it so socks and other small items were always falling through. 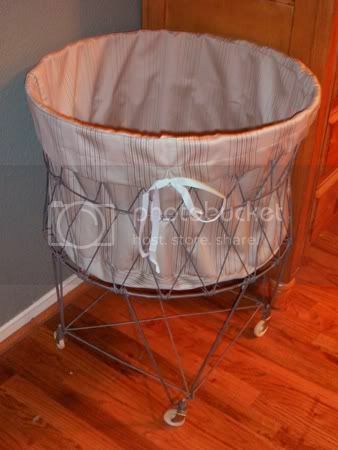 After seeing a similar hamper being sold at Pottery Barn with a liner, she asked me if I could make one for her. Above is a photo of what I came up with. What I Did: Basically I made a cylinder out of fabric. The bottom is a circle and the sides were made of two flat panels sewn together. I folded over fabric at the top to create a space for the drawstring and so that the "good" side of the fabric would show when it was folded over the lip of the hamper. What I Liked About the Project: It was fairly simple and didn't take much time to do. What I Didn’t Like About the Project: The hardest part was matching the stripes on the vertical panels so that the pattern would look continuous.